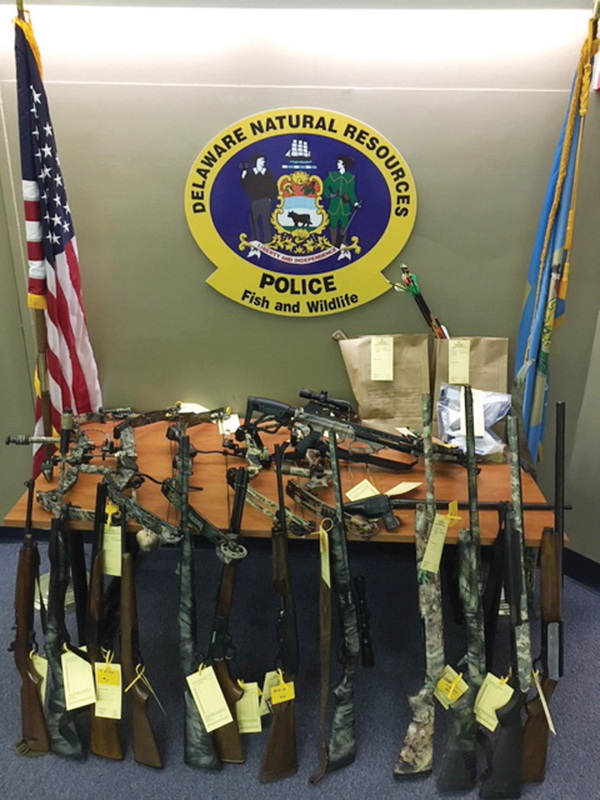 Guns, bows, knives and ammunition are among the evidence seized in the Dec. 11 arrests of two Millsboro men on charges related to alleged weapons and poaching violations. DNREC Fish & Wildlife Natural Resources Police officers on Dec. 11 arrested two Sussex County men for multiple alleged weapons and poaching violations while officers investigated a report of individuals trespassing to hunt near Millsboro. Brendon Dibble, 20, of Millsboro, was charged with one count each of possession of a firearm by a person prohibited, unlicensed hunting, trespassing to hunt and failure to display required hunter orange during a firearms deer season. He was released on a $2,200 unsecured bond, pending a future court appearance in the Sussex County Court of Common Pleas. William Novello, 49, of Millsboro, was charged with 15 counts of possession of a firearm by a person prohibited, two counts of unlicensed hunting and one count each of trespassing to hunt, failure to display required hunter orange during a firearms deer season and unlicensed trapping. He was released on a $30,500 unsecured bond, pending a future court appearance in the Sussex County Court of Common Pleas. As a result of the arrests and search of the men’s residences, a crossbow, four compound bows, 14 firearms, numerous knives and ammunition were seized, Fish & Wildlife officials reported.